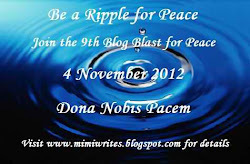 Well, today's Blog Blast For Peace Day; a day when bloggers around the world all blog about one thing: P-E-A-C-E. It's a serious subject. But seeing how I manage a humour blog I have a bit of a different take on the subject. This is the post I've been publishing the last several years. I like it so much I thought I'd run it again. Enjoy. And peace. Worth a hearty groan every year! And I enjoyed this year almost as much as last year and the year before that and the year before that....HA! It's one of my all time favourites. I gotta keep bringing it back. Quirks, you're alive! i hope you'll enjoy it next year! Peace does begin with a smile, and smiles often lead to laughter, and humor is the spice of life. So once again I applaud this post that reminds us that peace is a serious subject, but that we shouldn't take ourselves quite so seriously. Thanks T&P. If this post makes people laugh while thinking of peace then my work here is done. Peace to you too. Humor is so appreciated, midst all the travails. Lovely. Glad we could make you smile. It's a little tradition of my own. I'm glad you enjoy it. It gives me a peaceful easy feeling.